Japanese Episode 231: "Roketto-Dan to Deribaado!" English Episode 522: "Dues and Don'ts"
After yet another humiliating defeat, Musashi, Kojirou, and Nyasu hold a meeting to decide what's going wrong. After a lot of bickering, Kojirou comes to the conclusion that the fact that they only have four pokemon between the two of them is the leading cause of their failures. Suddenly, Musashi-tachi encounter a Delibird in a cage, just sitting in the middle of the forest! 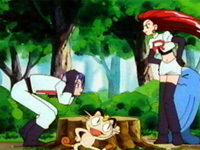 A voice announces that the pokemon will be theirs if they can defeat it, and the penguin is eventually knocked out by Musashi's Sonansu. The voice reveals itself to be an elderly lady, and she congratulates them on passing the test! The lady, Kanyuu no Obasan ("The Old Lady of Invitation") invites the duo to join the Rocket-Dan, but Musashi-tachi argue that they're already members. A search through a database reveals that their registration had been deleted, so Musashi-tachi have to register all over again. In order for the registration to be complete, there's going to be one more test: the Old Lady tells them to steal some trainers' pokemon using the Delibird. The first trainers they come across are Satoshi-tachi, so Musashi-tachi's final test begins. Delibird is a strong pokemon with powerful ice attacks and explosive presents, but Pikachu is able to beat it after it catches a lucky break. The Rocket-Dan are blasted away and are greeted by the Old Lady once they land. She tells them that Delibird will come around every now and then to collect payment for all the debts owed to the Rocket-Dan, but Musashi-tachi aren't worried at all. Musashi believes that whenever the Delibird comes around, she can simply use it to capture Pikachu. With a (sorta) new pokemon and new registration cards, the Rocket-Dan happily continue following Satoshi-tachi. Now if we only had more Jouto League episodes like this one, the season wouldn't have been so hellish. This is a great episode that focuses on the Rocket-Dan and finally addresses some of the questions fans may have had throughout the series. We get to see that the issue of Musashi-tachi's white uniforms is finally addressed, that the Rocket-Dan really does keep track of all that money that Musashi and the gang spend, and that Musashi-tachi aren't registered as members of the Rocket-Dan anymore. We're also treated with two new Rocket-Dan members (the old lady and Jinjii) and the fact that Musashi-tachi get a new pokemon. Add to the fact that the arguments are funny and the animation is exceptionally wacky and we have one great episode. Dub-wise...nothing important to report. No cuts, no censors, no digital paint, nothing. Though I would like to mention that I think it's funny that an episode opening with Jessie and James dressed up as football players premiered the day before Super Bowl XXXVII. Careful planning on Kids' WB! 's part, or merely a coincidence...? Delibird keeps its Japanese voice. FIIRUDO kakeru Roketto-Dan no futari niwa! While the Japanese version just replaced a few words here and there with football terms, the dub pretty much rewrote the entire thing. It doesn't matter either way, I'm just desperate for something to report. While the music replacing was better than the last episode (in this one, almost half the music was kept), a piece that was cut from the end of the episode stood out--an instrumental of the ending theme Maemuki Roketto-Dan. This was played from the time Kojirou opened up the receipt Delibird gave him until the end of the episode. 4Kids could have played it, seeing as how it didn't have any of those evil Japanse words in it, but I guess they didn't want to.